This name may signify 'cross mountain' in the sense 'transverse', but since this does not seem to suit the topography, it may rather be due to a cross once located on it. Cross Slieve is the 1382th highest place in Ireland. Starting point at beach in Cushendall (241280 D) in company of golfers, children playing in the park, sea air and the noise of waves crashing. Follow the rough lane uphill and turn off right on a green track which drops and rises to the cliff path, giving great views over the beach and across the bay to bigger hills. Numerous landslips have eaten to the edge of the path in places giving the path a precarious feel. The path turns inland at a steep gully. A faint and overgrown track heads off downhill to the storm beach at Port Obe below. This is well worth a diversion and i disturbed 2 herons as I passed by an impressive waterfall coming down the gully and flowing out to sea. A nice bit of lunch on rocks with waves lapping at my feet before i headed back uphill. Continued on the path and was met by barriers with 'cliff path closed' signs which had not been present at the other end! OOPS!! Layd Church presents itself and is a pleasant sight surrounded by trees and the stream bordering its edge. 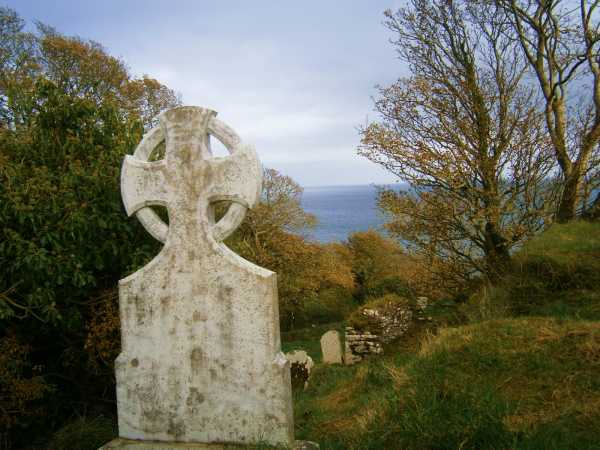 Established in 1306 it is well worth exploring the church and memorials which look out to sea. Continue uphill past a carpark with stunning views, turn right onto the road and follow for 5 minutes before turning left and going uphill to reach the strangely located Glenville caravan park. A farm track (mentioned elsewhere here) has a gate with 'beware of bull'. A farmer was out in the fields in his 4x4 and a chat confirmed that it was okay to follow the track which goes all the way to the summit. It also confirmed that it was always good to ask and give respect! I gave a herd of cows a wide berth as i went uphill past old farm buildings. Views open out dramatically and the top is reached in an hour. Even on a dull day the views up 5 of the the Glens to higher tops were fine as were those out to sea. A pair of buzzards circled and rose on the winds ever higher above me. A fairly short walk brings the second slightly lower top and little Ellen's Lough. Drop down to the 2 transmitter masts and take the lane to the road. This drops gently back into Cushendall for the next half hour, with the other end of the rough lane (241284 E) providing a short cut back to the carpark.